Many industrial systems are required to transport non-uniform loads like water for cooling or material for processing. These loads affect the life cycle of the mechanical components of the system. 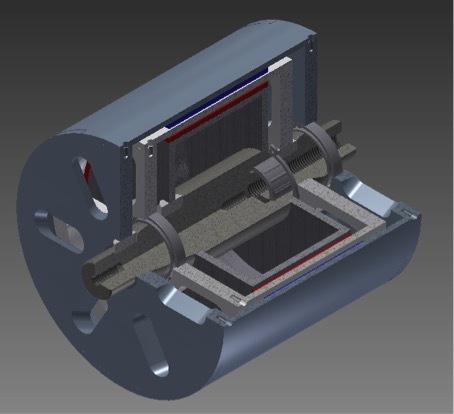 The Magnetic Damper Coupling (MDC) mechanically decouples the load from the electric motor and protects it when torque overloads occur. Installing of the coupling also reduces the risks of bearing and gearbox failures. Additional to the protection, the coupling dampens variable torque loads and increases the efficiency of the system by up to 5%. The robust nature of the technology means that it can operate under normal conditions for over 20 years. Gearboxes and motors in industry are over designed to handle torque overloads; the MDC dampens these spikes allowing future gearbox design to be smaller and cheaper. The MDC is a magnetic coupling that does not rely on a mechanical connection for the transfer of torque in a system. It protects the gearbox and motor from mechanical overload and high start-up torque. With the unique damping function, it is able to increase the efficiency of a mechanical system with a variable torque load of up to 5% resulting in long-term energy savings. What sets this technology apart from its competitors is not the MDC itself but the design procedure. With the use of fast stimulation methodology and powerful machine learning algorithms, a custom coupling can be designed in a very short time. The MDC is a mechanical low pass filter that filters out high frequency disturbances in applications where motors are present. Besides protection, it has the capability of filtering out all frequencies above ~3 Hz. This functionality is due to the speed difference between the two rotor components. The MDC has a radial magnet topology which is stronger than its axial counterparts, using less steel which reduces its mass significantly. Initial measurements on a small 2.2 kW system shows up to 5% efficiency increase of the system. The MDC is also capable of handling overloads of more than 3 times its rated torque. A proof of concept has been developed. The prototype has been designed, manufactured and tested in the laboratory. The next step is testing the MDC in different industrial applications.